The use of porous or nonporous suspended microcarriers in traditional stirred-tank or airlift bioreactors makes it possible to increase the available growth area for anchorage-dependent cells. Recently, ATMI LifeSciences (www.atmi-lifesciences.com), Artelis (www.artelis.be), and Pierre-Guerin Biolafitte (www.biolafitte.com) teamed up to develop scalable, disposable bioreactors to meet this need. This new scalable bioreactor features noninvasive paddle-mixing technology developed by ATMI, standard DO, pH, and temperature probes with a Tryton® monitoring device from Pierre Guerin Technologies, and is made out of materials compatible with the growth and viability of animal cells. Preliminary tests, set-up, and cultures were performed by Artelis. 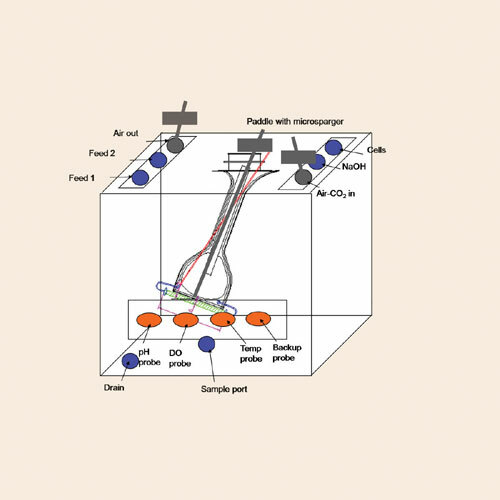 The paddle-mixing system provides gentle agitation to protect animal cells growing on the microcarriers at high cell densities. The bioreactor is able to agitate the cultures without causing bead-to-bead shock that can damage the cells, while a microsparger fixed to the paddle ensures oxygenation (Figures 1A and B). Madin-Darby bovine kidney (MDBK) cells were cultivated on Cytodex 1 (GE Healthcare (www.gehealthcare.com) carriers (6 g/L) at 37°C in MEM with 5% (v/v) fetal bovine serum and 1% (v/v) nonessential amino acid solution. 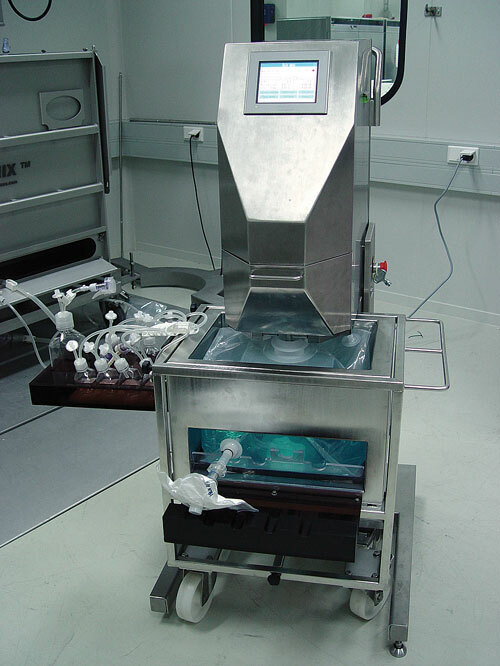 The growth of the cells and the production of bovine herpes virus (BHV) were investigated in cell factories (CF-10) of 6,320 cm2 as well as in a disposable bioreactor (25 L culture bag with 15–21 L of culture medium). Gas-transfer capabilities were estimated by dynamic absorption of air into a liquid simulating the culture medium (3 g/L glucose, 10 g/L NaCl). The number of cells was determined after cell lysis by counting cell nuclei using a Guava(www.guava.com) PCA analyzer. Photographs of the beads were taken each day during cultivation. Metabolites were analyzed with a Bioprofile 100 (Nova Biomedical www.novabiomedical.com) enzymatic analyzer. 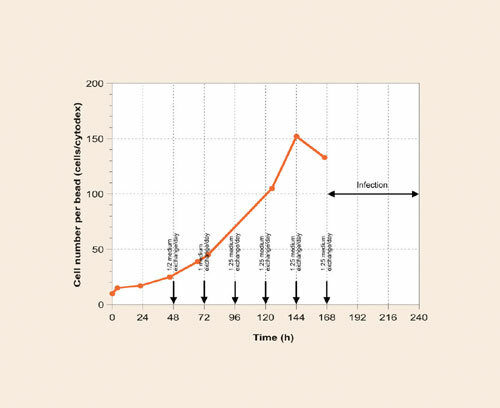 Gas-transfer coefficients of up to 7×10-3 s-1, or 25h-1, at 0.05 vvm were obtained in the model reactor at both 25 L and 200 L, suggesting that the bioreactor’s design is able to support the growth of the most typical cell lines at high densities. In addition, mixing tests were carried out in the medium without cells in order to check that a rotation speed of 30 rpm was sufficient to keep microcarriers in suspension without damaging the beads (Figure 2). 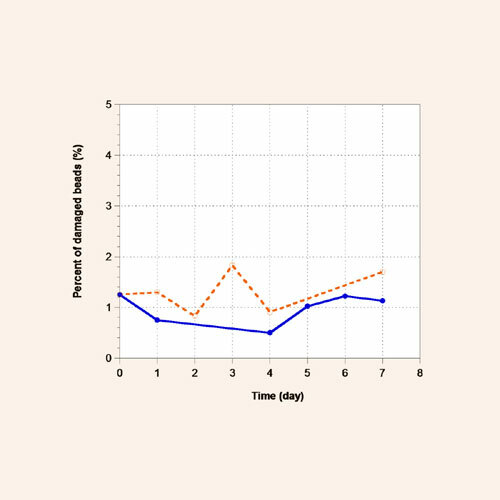 The cultivation and viral infection of MDBK cells immobilized on Cytodex 1 in the bioreactor was investigated (Figures 3 and 4). Cells were inoculated at 10 cells per bead in the 25 L disposable reactor, which contained a working volume of 15 to 21 L of culture media. The medium was renewed in order to keep glucose concentration above 3 mM and lactate below 10 mM. During culture, DO was controlled at 50% air saturation by bubbling pure oxygen through a microsparger. The pH was maintained within a range of 7.0–7.2 by injection of CO2 or NaOH. 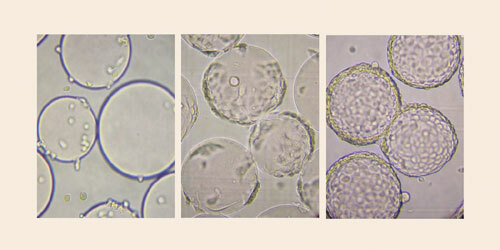 After six days of cultivation, cells reached a density of 150 cells/bead at confluence, corresponding to 5.9×106 cells/mL, which reflects a 15-fold increase. At day seven, the cells were infected (MOI=0.15) with bovine herpes virus. Virus titer was 3.5×108 PFU/mL 72 hours post infection. Virus production run in stationary cultures in cell factories led to a virus titer of 8.7×107 PFU/mL, which conforms to the difference in cell density between both cultivation systems. These results demonstrate that it is possible to cultivate immobilized cells while producing viral particles in the disposable bioreactor. The experiment shows that this industrial bioreactor integrates mixing, sparging, and thermostatic functions as well as measurement, control, and monitoring systems just as well as conventional reactors. This disposable bioreactor provides a viable alternative for the cultivation of adherent cells and the manufacture of viral vaccines and vectors, and it can support both suspension and adherent cell cultures.